Chad joined Hampton Roads Orthopaedics & Sports Medicine in January 2016. He graduated from Virginia Polytechnic Institute and State University with his Bachelors of Science Degree in Biology in May 2009. He subsequently received his Doctorate in Physical Therapy from Lynchburg College in May 2013. 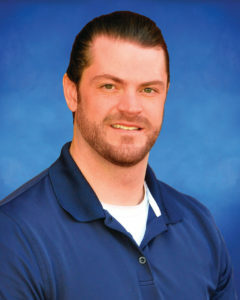 Prior to joining the physical therapy staff at HROSM, Chad served the Tidewater area practicing in geriatric rehabilitation and skilled nursing care. Chad played defensive end for Virginia Tech from 2005- 2009 where he gained interest in orthopedics and sports medicine. He recently served as a volunteer football coach for Poquoson High School. During his free time he enjoys playing guitar,sports, and boating.